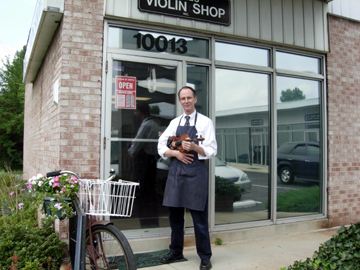 Gailes’ Violin Shop, located in College Park, Maryland, specializes in quality instruments, bows, repairs and restorations. We also carry a large selection of music and accessories. Bill Gailes was majoring in music performance at the University of Maryland in 1974 while working as a free-lance musician and studying violin making with a local craftsman. After completing his first violin, Op. 1 No. 1, in 1975, Bill decided to concentrate on making and repairing bowed stringed instruments. He continues to study restoration technique at summer sessions with Hans J. Nebel (almost every year for over 30 years). He has studied with Arnold Bone on bow rehair and repair, and with Samuel Kolstein (yes, once upon a time we did bass repairs), and even a short course with the great Dario D’Attili in 1975. Today Bill’s time is divided between repairing client and shop-owned instruments, sampling and testing new and old instruments and bows for possible additions to our inventory, and repairing varnish on our old and antique instruments. 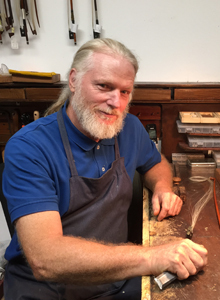 David McDermott has been working with Gailes’ Violin Shop since 1985 when he graduated from the Chicago School of Violin Making. 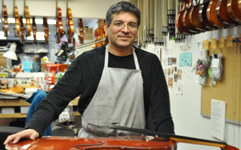 In addition to fine repairs and restorations, he is a gifted maker of violins, violas and cellos. His instruments are available at Gailes’ Violin Shop and pictures are available on the violin page. Tom Carroll has worked with Gailes’ Violin Shop since 1976. Tom studied with Geary Baese and now does all of the varnish work on our ‘white’ instruments. He also studied with Hans Jurgen Nebel and does some repair work at the shop. In addition, Tom has his own business, buying instruments in the white, varnishing them, and selling them at shops throughout the country from Maine to Georgia to California and Washington, and including Gailes’ Violin Shop. Mark Mihlbauer has been responsible for all of our bow repairs, restorations and rehairing since 1980. He studied at the University of New Hampshire Violin Craftsmanship Institute. He particularly enjoys the challenge of restoring antique bows. 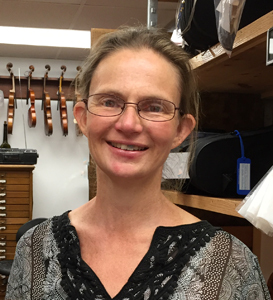 Susan Huemrich joined the Gailes’ Violin Shop staff in 2003. She studied business at Robert Morris University and now manages our business office. 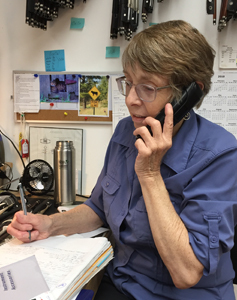 In addition, she assists clients with instrument rentals and purchases and maintains the music inventory. Eddie Matus is a graduate of the Violin and Bow Making Schools of Cremona, Italy, as well as of the UTU Guitar Making School of Uruguay. As a violist, he was a member of the various music groups, ranging from symphony orchestras to popular music groups. Eddie speaks three languages, Italian, Spanish, and English. Din Vilela is our newest prentice. He came to the U.S. from Peru in 2012 and began working for the shop shortly thereafter. He has a natural ability for violin repair and has become an important member of the repair staff. When he is not working at GVS, he races mountain bikes. Amyr Joyner is an accomplished violinist who has performed both orchestral music and chamber music. He has his bachelor's and master's degrees in music performance from Peabody Conservatory. He is currently a doctoral candidate at the University of Maryland and teaches violin at the International School of Music in Bethesda. Liz Vincent Originally from eastern Washington state, Liz has lived on the east coast for many years and in College Park for the last 15 years. In her previous careers, she has been a massage therapist and an administrative assistant on commercial construction sites. She is passionate about animals and the environment. Here at GVS, she is in charge of accessories and is a great help to customers. Andrew Jones is a graduate student at the University of Maryland pursuing a degree in music performance. He has extensive chamber music experience and has performed with regional orchestras along the east coast. Andrew is currently active in the Maryland and Washington Metropolitan area with performances and teaching private viola and violin lessons. For interest or questions about private lessons or contracted events please contact at jonesandrewM017@gmail.com. Betty Gailes has worked at Gailes’ Violin Shop off and on since 1999 when she and Bill got married. Currently she works mostly from home maintaining the website and handling all aspects of advertising. When she’s not working for GVS, she teaches music full-time in an elementary school.